Brussels…Love ’em? Hate ’em? Try them! 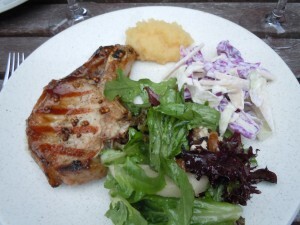 I find that many people are divided about their likes and dislikes with food. Texture is a big deal. Some prefer more or less spice. But one food seems to really divide people and that’s brussels sprouts. People seem to love them, hate them or won’t try them. This is definitely a case of depends on how you prepare them. No one likes anything cooked to bitter mush, which is what some people remember them tasting like as a kid. They are overcooked or boiled and lifeless. 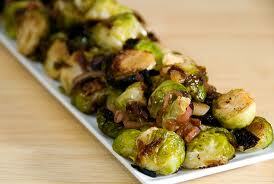 I’ve shared a favorite brussels sprouts recipe before for brussel leaves. However you don;t always have time to peel. This year I’ve been making a quick roasted brussels sprouts recipes that are enticing people not ask for an actually try (and enjoy) brussels sprouts. First there was a “feast” at my son’s school. This was very cute as each child brought in a favorite recipe to share with the class. They each got up and told why they brought the dish, when they usually eat the dish and if there was any significance to their family. They are next making a poster with the written recipe with a photo of them with their dish. Recipes had to be approved by the teacher first because otherwise we would have all been eating our favorite family desserts only. My son asked me to make stuffed grape leaves and while I loved the suggestion I was short on time. Next he asked for brussels sprouts. I loved this idea because I am always asking people to try them. And in the class there were a few kids (and adults) who tried them for the first time. Especially cooking for babies, getting to be there for a first bite is so fun. It’s still fun for me if it isn’t babies. The sprouts were eaten, with the exception of about 5 pieces, and my daughter polished those off in the car on the way home from school. We had a potluck for my son’s tae kwon do that night and wasn’t sure what to bring. It’s always a lot of pizza and desserts. We decided to head to the store for more brussels sprouts and I made them again for that night. It is not even the holiday yet and I made two batches in one day. I thought my kids would be burned out on these, but my daughter asked yesterday, “Can you make brussels sprouts for Christmas?” Sure I will. Choose small firm compact heads with tight fitting leaves that are bright green in color for the freshest taste. Preheat oven to 425 degrees. Line a baking sheet with foil. Trim bottoms of brussels sprouts, but keep leaves intact. Cut each sprout in half lengthwise. 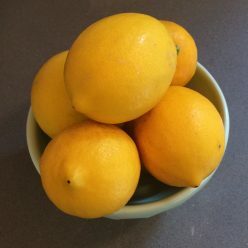 Place sprouts in a plastic bag or bowl with oil and toss to coat. Place sprouts on baking sheet, sprinkle with salt and bake for 12 – 15 minutes, turning halfway through. 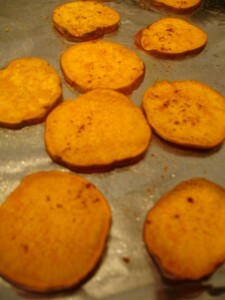 Bake until outside leaves begin to brown and crisp, and inside is fork tender. Sprinkle with cheese and serve warm. Because of all the apples we’d harvested at the u-pick, I was inspired. And admittedly a little over the top with my obsession with making an apple meal. By this I mean, using apple as an ingredient in each food. 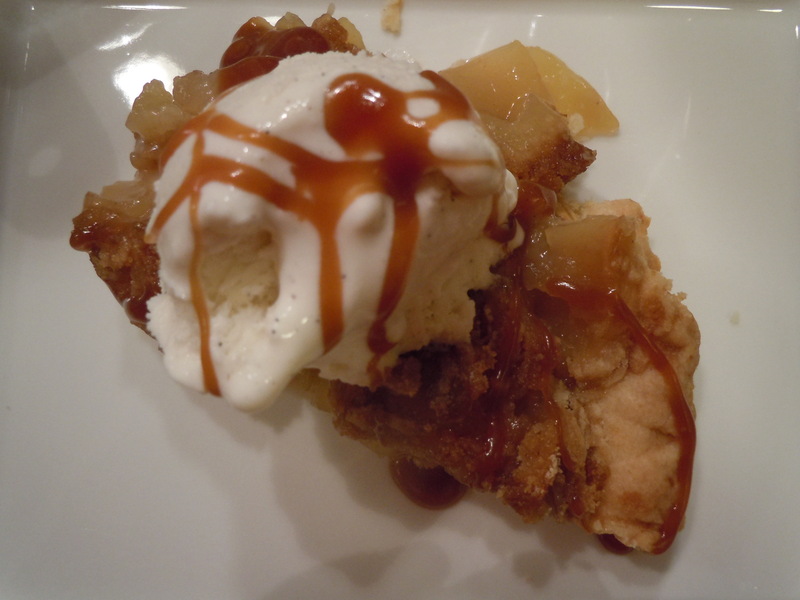 Also I also must admit, it was tasty and fun, and we now have only about a dozen apples left. Note: I suggest if you have an abundance of apples – make applesauce of course. This was great for my son who can’t enjoy raw apples easily with his new mouth hardware. It can be swirled into yogurt, oatmeal and ice cream. And also is a great way to create moist and nutritious baked goods. 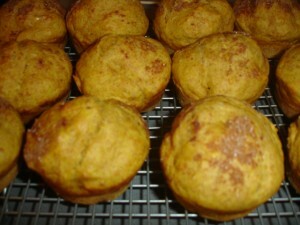 This week I made apple banana bran muffins for my kids’ school snack. Anyways… we invited our friends over for dinner, who we picked apples with. Luckily they weren’t too burned out on apples (or just too polite) to go with my theme. Over the course of a few days of planning and prepping we were ready for our apple feast. Our guests were creative and brought two wonderful sides that went perfectly. (No really. I can’t say how much I appreciate it when someone offers and actually brings something that goes with the meal, rather than just bringing something because they think they should. Your host doesn’t want extra food for that meal, unless you’re assigned. O.K. so yes, that it a pet peeve of mine.). 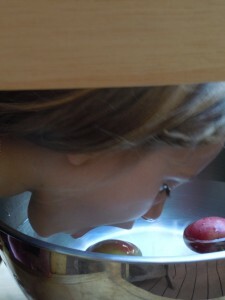 We started the evening with apple bobbing. 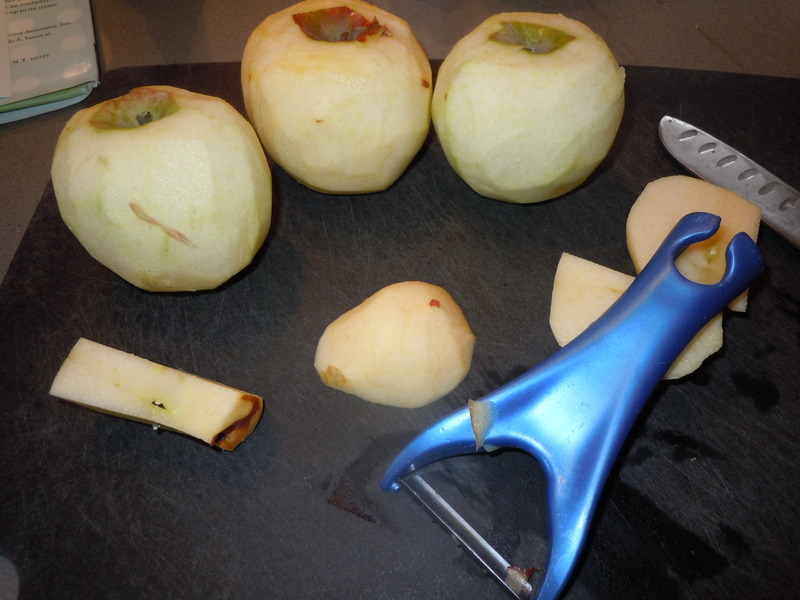 This was a great activity to use those little tiny apples we picked. The kids had fun coming up with ways to get the apple (nope, the stem is cheating) and finally dunking in head first (my son had seen this in a contest at school last year). 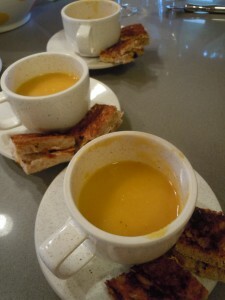 Here’s the soup recipe because it is so easy and perfect on a chilly autumn night. I like to roast a halved butternut squash in the oven a day or two ahead, then scrape out flesh to make this soup even quicker. This is a simple, sweet and aromatic soup that only requires a few ingredients. It can be enjoyed with a salad and bread for a nutritious lunch or dinner, or as a comforting autumn snack on a chilly day after playing outdoors. 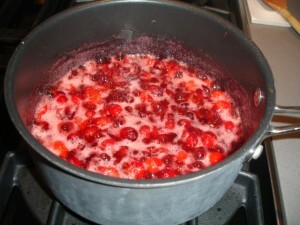 When ready to eat, return puree to saucepan and stir in milk. Heat through over medium heat until hot. I have to say it went over well. 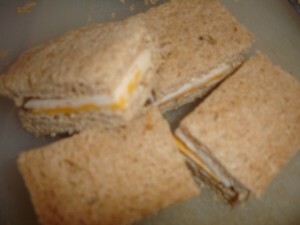 Most kids ate something, and some even asked for seconds of fruit and sandwiches. The kids were very proud of their handmade tablecloth, which was painted butcher paper. So cute. 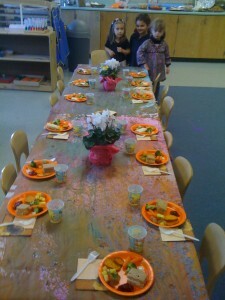 All four kindergarten classes ate soup together with teachers and some families and siblings. 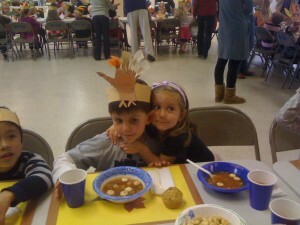 Each class had made their own version of turkey hats and leaf placemats, which they were proud to bring home after. The soup and muffins were appreciated and eaten. Here’s a picure of my son and daughter sitting together. The teacher is so sweet and treats her like one of the kindergartners. After just coming from her feast, I was surpirsed to see she ate more than some of my son’s friends.